Samsung will be launching the Galaxy S9 and S9+ at the Unpacked 2018 event on February 25th, and we already know a lot about both the phones. Just like every year, Samsung is going to launch the phones with Snapdragon 845 as well as the Exynos 9810. The Exynos 9810 is Samsung’s in-house chipset that was recently benchmarked on Geekbench and showed impressive performance as it outperformed the Snapdragon 845 regarding the scores. 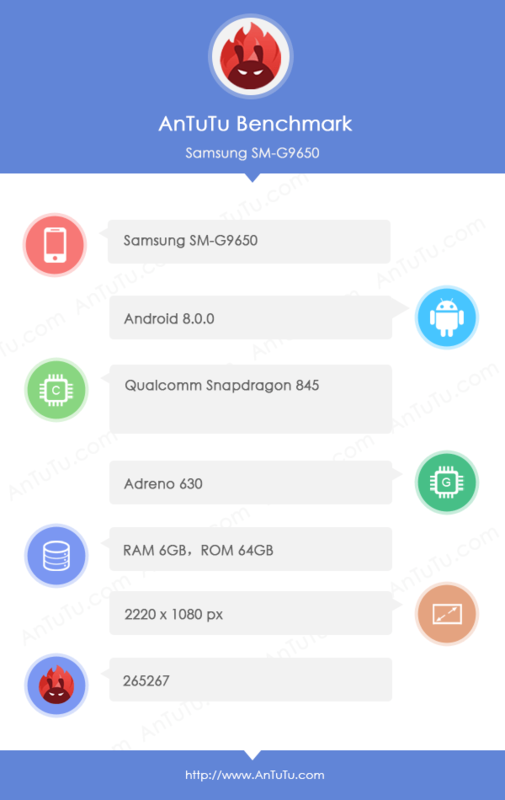 Today, the Samsung Galaxy S9+ (SM-G9650) showed up on AnTuTu benchmark that has revealed the Snapdragon 845’s AnTuTu benchmark scores. The AnTuTu listing also confirmed some of the previosuly leaked specs including a 2220x1080p display, Snapdragon 845 processor, Adreno 630 GPU, 6GB RAM, 64GB ROM and Android 8.0.0 Nougat. The phone scored 265K+ (265267 to be precise!) on AnTtuTu benchmark which is more than the AnTuTu score of iPhone X (225K). It looks like the performance of the S9 and S9+ is going to be very impressive with the Snapdragon 845 processor. We are yet to see the scores for Exynos 9810 chipset that will surely score more than the Snapdragon 845.